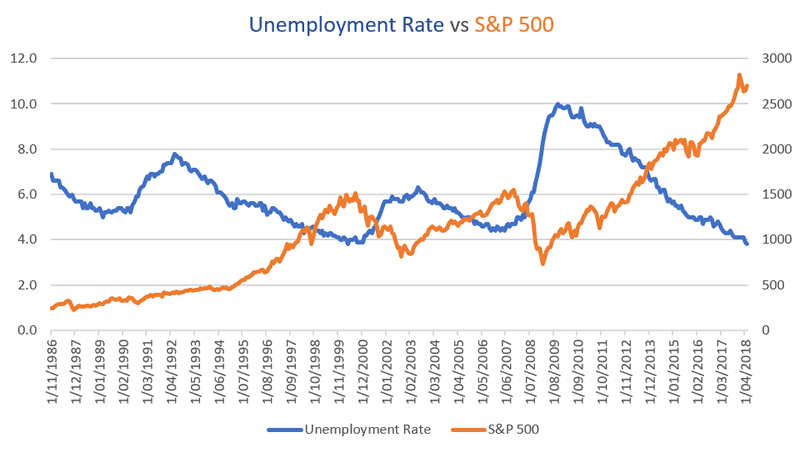 As always, the economy’s fundamentals determine the stock market’s medium-long term outlook. Technicals determine the stock market’s short-medium term outlook. Here’s why the stock market’s short term downside is limited while the medium-long term is bullish. As always, we go from the long term, to the medium term, to the short term. *A recap of this week’s thoughts and market studies. The Medium-Long Term Model states that there is no “significant correction” or bear market for U.S. equities on the horizon. Last week I wrote about Why the economy is still too strong to induce an equities bear market and recession. Not much has changed about the U.S. economy – it is still improving at a decent pace. The Unemployment Rate, Initial Claims, and Continued Claims are still trending down. These leading indicators tend to trend upwards before an equities bear market and economic recession begins. Meanwhile, corporate profits continue to trend higher, even when adjusting for inflation. Historically, corporate profits (inflation-adjusted) tend to go down for a few quarters before an equities bear market or “significant correction” begins. Households’ Networth and Consumer Confidence are still trending higher. These are also leading indicators for the stock market and economy. These 2 economic indicators tend to trend downwards before an equities bear market begins. Truck Tonnage continues to increase. This leading indicators tends to trend downwards before an equities bear market begins. The stock market’s short term is notoriously difficult to predict. It is mostly random. Predicting the medium term is easier. 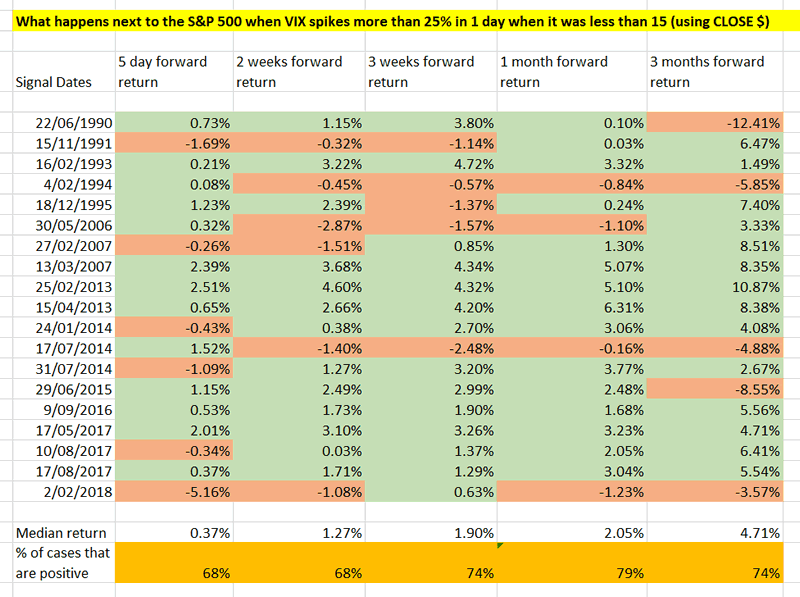 Various market studies from the past week demonstrate that although short term downside risk is present, this risk is limited because the stock market’s medium term bias is bullish. 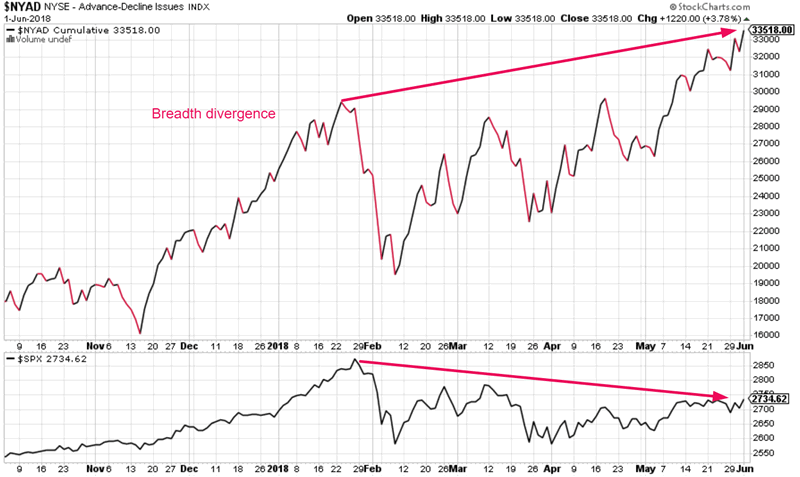 For starters, breadth continues to form a bullish divergence with the S&P 500. This is a medium term bullish sign. 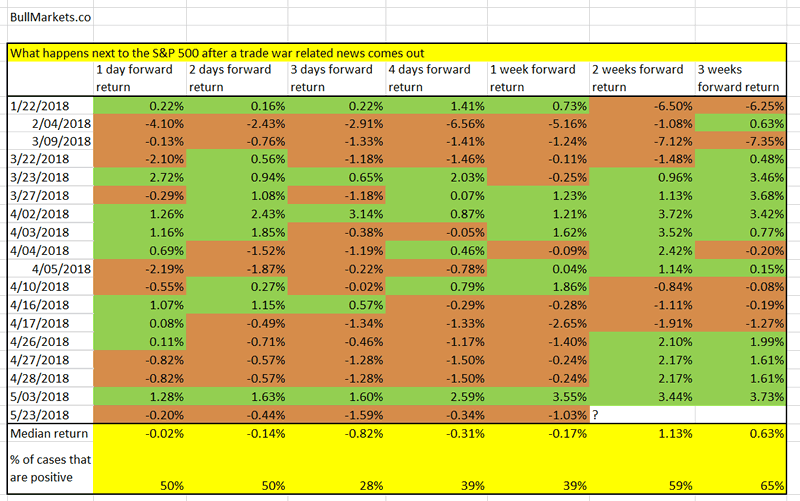 See the S&P’s forward returns (all the GREEN). The stock market’s volatility (VIX) spiked and then cratered. 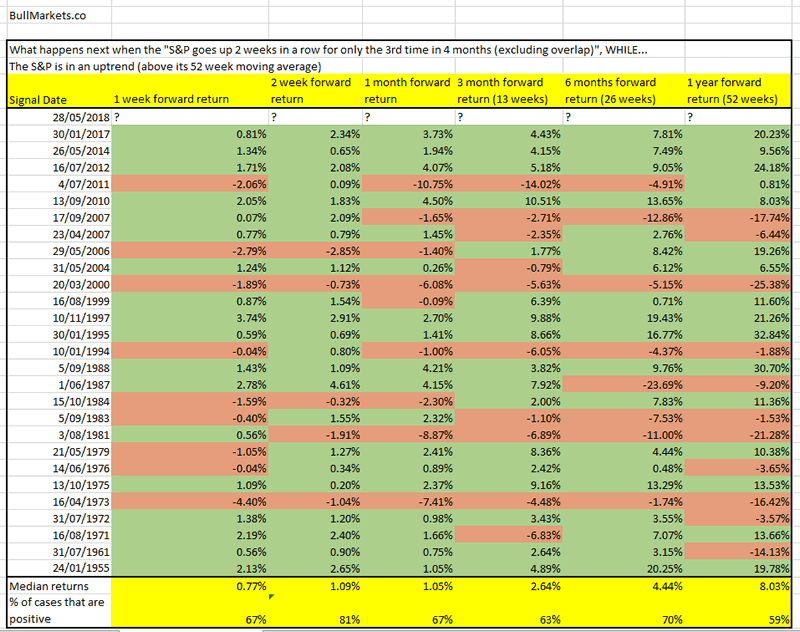 The S&P’s 1-3 month forward returns are bullish. But considering that the stock market just went up 2 weeks in a row, even the short term risk is limited. The forward returns after 2 weeks are positive 81% of the time. The long term is bullish. January 2018 was not this bull market’s top. The medium term is bullish. The stock market will probably trend higher over the next few months. This study suggested that the stock market will make a new high before summer 2018 is over. The stock market’s short term is 50-50. Focus on the medium-long term. Have a great weekend, and please share this on social media!